We provide this information to support rangeland managers in their response to a changing climate in Western Australia. The information on this page is a summary of information contained in Bulletin 4856 Carbon farming in relation to Western Australian agriculture (PDF 1.4MB). Savanna woodlands and grasslands cover about 1.9 million square kilometres – about 23% – of the Australian continent, with most savanna fires occurring in northern regions where the cycle of wet and dry seasons make them particularly prone to fire. 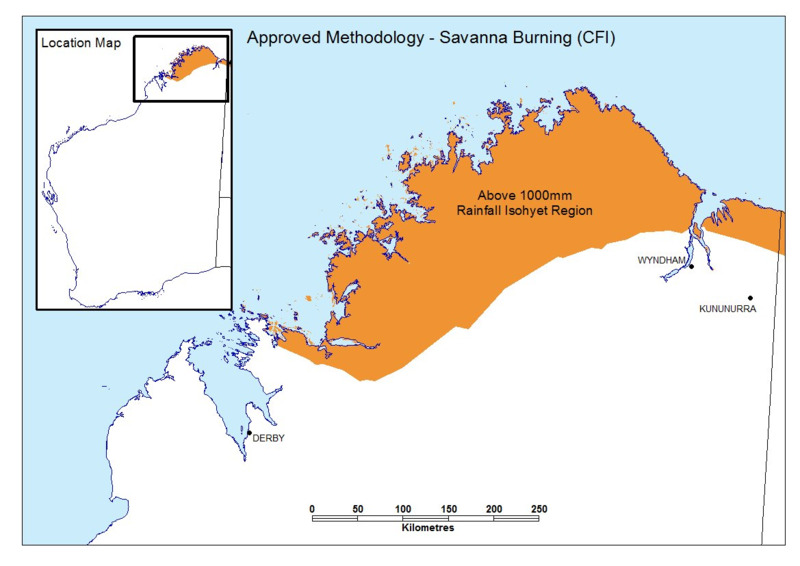 'Savanna burning' has been used in greenhouse gas emissions accounting to encompass biomass burning in a wide range of northern Australian vegetation types, including tropical and subtropical grasslands (savanna), woodlands and shrublands. Savanna grass and shrub vegetation grows quickly during the 5-month wet season (January to May) then cures during the dry season to form a continuous vegetation layer that can carry fire long distances. Fire return intervals are shortest in vegetation dominated by highly flammable spinifex grasses, which cover extensive areas of inland WA. In northern WA, fires may recur every 1 to 2 years. Fire intervals tend to increase to the south, along the gradient of decreasing average annual rainfall, from about every 5 years at latitude 19°S to about every 10 years at latitude 24°S. However, in the more-variable rainfall regimes of arid Australia, fire occurrence is irregular because it is determined by prior rainfall. Only the nitrous oxide and methane emitted during fire events are accounted for in the National Greenhouse Inventory (see Tracking Australia's greenhouse gas emissions). Carbon dioxide emissions are not included because it is assumed that an equivalent amount is removed from the atmosphere through vegetation regrowth. Greenhouse gases emitted from savanna fires average 3% of Australia’s emissions. Savanna burning contributes more than 95% of the burning emissions in WA, making savanna burning a priority area for abatement. In 2009–10, savanna and agricultural residue burning contributed 35%, or 2.3 megatonnes of carbon dioxide equivalents (Mt CO2-e) of WA’s agricultural emissions, equivalent to 3% of total WA emissions for the year. The benefits and risks are different for managed and unplanned (wild) fires. Traditional Aboriginal land management produced fine-scale mosaic fire patterns and these have largely been replaced by more widespread and intense fires that occur mainly in the latter half of the dry season. Greenhouse gas emissions are much greater from late dry-season fires than from early dry-season fires. damaged infrastructure, such as fences and bores. The Kimberley Regional Fire Management Project (2000–05) suggested that the annual cost of unplanned fires ranged from $50 000 to $400 000 per property because of damage to infrastructure and reduced pasture production. A study in Cape York Peninsula found the cost of an unplanned fire that affected at least two-thirds of an 1100 square kilometre property to be $32 000. Kimberley properties are 2 to 3 times this size. The West Arnhem Land Fire Abatement project has shown early dry-season fires are more patchy than late dry-season fires, leaving 29% unburnt compared to 11% in late dry-season fires. Early dry-season fires also burn at lower intensity, typically emitting 52% less methane and nitrous oxide per hectare (ha) burnt compared with late dry-season fires. A critical assumption regarding greenhouse gas abatement is the management efficacy of prescribed burning. Every 26ha burnt in the early dry season avoids emitting 1 tonne carbon dioxide equivalents (t CO2-e) per hectare, which is worth about $12.85/t CO2-e: this is based on measurements from the Northern Territory that indicate reductions of 34% of methane and nitrous oxide (the only greenhouse gases accounted for in the methodology), with 25% regarded as a conservative estimate of abatement. Early dry-season prescribed burning may lead to an increase in the biomass of woody vegetation, which increases carbon storage through increased biomass. However, a build-up of woody perennials reduces grassland productivity, and woody-weed control will need to be part of the fire regime. There is a savanna fire management methodology for areas receiving greater than 1000mm, and for areas with 600–1000mm of average annual rainfall. There are several registered savanna fire management projects operating in WA. Proponents of savanna fire management projects should contact local government, the Department of Biodiversity, Conservation and Attractions and the Office of Bushfire Risk Management within the Department of Fire and Emergency Services for specific advice about applicable bush fire regulations. Proponents should also hold appropriate approvals under WA law and comply with the future acts regime of the Native Title Act 1993 (Commonwealth).